The City of Gaithersburg, north of Rockville is home to many restaurants and bars. The Gaithersburg Police officers may only exercise police powers within city limits. Leonard R. Stamm represents clients that have been charged with DUI or DWI by Maryland State Police, Montgomery County Police, Maryland National Capital Park and Planning Police, Gaithersburg City Police, or Metro Transit Police in Gaithersburg, Maryland and has been doing so for over 30 years. 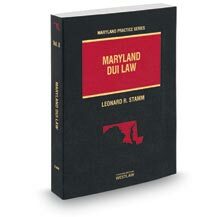 Leonard R. Stamm is the author of Maryland DUI Law, the definitive book on drunk driving law inMaryland. He is a former president of the Maryland Criminal Defense Attorneys' Association. He also the Dean of the National College for DUI Defense. (Click here to read and watch a video of his Dean's Address). He is rated "AV-Preeminent" by Martindale Hubbell, recognized as a Super Lawyer, and a Best Lawyer. He is also given a rating of "10-Superb" by Avvo. Unfortunately, most lawyers in Gaithersburg assume the case is too difficult to win in court or at the MVA and fail to challenge the State's case. Some lawyers never challenge the State's case. This can be a huge mistake since most DUI cases have issues that can be raised in defense, and with zero or very minimal penalty. In other words, the result of fighting and losing is rarely worse than just pleading guilty or not requesting a hearing at the MVA. So why would you want to choose a lawyer who will not fight your case? When interviewing a lawyer, you should ask if your lawyer intends to fight the case, and if not, why not. If you need to be defended or represented in the Montgomery County courts and have been charged with a DUI or DWI, or any other traffic violations, call Leonard R. Stamm today to schedule a free consultation. Leonard R. Stamm also has extensive experience representing individuals charged with criminal offenses in the District Court and Circuit Court for MontgomeryCounty. If you have been charged with possession of a controlled dangerous substance, possession of drug paraphernalia, assault, theft, malicious destruction of property, violation of probation, or any other criminal offense in Gaithersburg, call 301-345-0122 today to schedule a free consultation.